Detroit is not typically considered a beautiful city. Years of racial tension and industrial decay have instilled a grimy and unstructured picture in the minds of most people. Recently, new coverage of the city has revealed that Detroit, in fact, is a very cultured and artistic city. However, art is not new to the Motor City. Various artists of many different disciplines have contributed to the very fabric of the city. One of the most apparent forms of art in large cities is architecture. Detroit is home to many architectural landmarks, one of which happens to be the McGregor Memorial Conference Center, located on the east end of Wayne State University’s campus. In addition, the center is a certified National Historic Landmark by the American Institute of Architects. Affectionately referred to as the Arts Building by the students, the center was part of a four building project designed by architect Minoru Yamasaki intended to enrich the campus of the then expanding Wayne State University. Yamasaki envisioned a symmetrical building based around the architectural potential of triangular faces. Completed in 1958, the building is mostly composed of white travertine marble. Large beautiful windows open up into the atrium, which provide an abundance of natural lighting. The symmetry of the building is a powerful display of Yamasaki’s architectural prowess, as both the interior and exterior exhibit impeccable symmetry. The influence of triangles is also apparent, as the shapes are incorporated all over the building. Interior decorating was done using pieces selected by German architect/designer Ludwig Mies van der Rohe, providing a nice accent to the tall freestanding columns and teakwood partitions. The center is flanked to the south by a large L-shaped reflecting pool/sculpture garden, featuring four freestanding sculptures standing on three rectangular concrete islands, connected by large black, concrete slabs that serve as walkways. The actual center itself is elevated many steps above the pool. The pool was recently refurbished, and is considered to be one of the most beautiful sites in Midtown Detroit. To the north of the center, a courtyard features a blue abstract sculpture. Two of the most recognizable sculptures are The Nymph and The Faun, created by Italian sculptor Giacomo Manzu. The sculptures add a sense of serenity to the overall scenery, and have a calming effect on those strolling through the garden. Today, the center serves as Wayne State University’s primary conference facility and is home to the university’s catering service. It is open on weekdays for anyone who wishes to visit the pool or the center and admire the architecture. Wayne State’s campus is a public campus as well, meaning that the center is open to the general public for visitation. 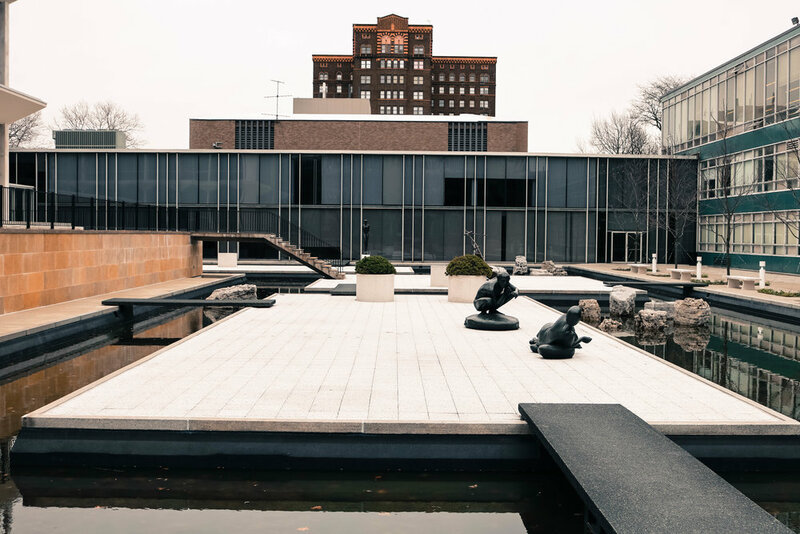 The McGregor Memorial Conference Center is a jewel in the city of Detroit, and it most definitely has the LVD stamp of approval. The other three buildings designed by Minoru Yamasaki are the Prentis Building, Wayne State University’s College of Education, and the Helen L. Deroy Auditorium. All are open for public visitation during hours of operation.